It is that time of year again where I divide my time between baking a zillion cookies (no, I am not kidding) and finishing up holiday gifts. For many years my Novembers and Decembers were spent as the stage director for a ballet company putting on The Nutcracker which pretty much ensured that complete exhaustion by the end of the run. I now have replaced that activity with others. I can't complain, no one is holding a gun to my head! This is a gift my dear little George left for me. He pulled this skein out of a bag and had a lot of kitty fun. There must be something about The Fiber Company's Cumbria that is intoxicating to cats. I untangled it and used it to make a hat for myself (see below). I am going to be updating the Basics class in the new year to match some changes to the Masters Program which is currently undergoing some revisions. As always, anyone who has taken the class in the past can request the new materials. I will post a message when the updates are made and ready. I had an email from someone who liked the entry I did on one row stripes in flat knitting and asked if there was a technique for circular knitting. I said there was and that I would do it for my tip this week. Well, I should have checked the index before doing this post but what can I say, I've done a lot of videos so now there will be two. Also Helix Knitting is the topic of the Stitch Anatomy lesson in the Spring issue of Cast On. Leslie Gonzalez wrote the article and has two wonderful pillows to demonstrate the technique. I have a fondness for this technique. I "discovered" it in Montse Stanley's A Knitter's Handbook (which is full of arcane tips if you just sit down and read it). I used this technique for the very first pattern I did for Cast On magazine a million years ago. It was called Varsity Socks and since the magazine is published in Ohio, they selected Scarlet and Gray, colors of The Ohio State University. Basically, how this technique works is that you divide the total number of stitches by the number of colors you have. 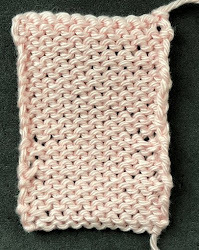 In my sample I have 32 stitches and two colors. I cast on 16 stitches in each color. You can work this technique on circulars but my sample is on DPNs. If you look at the photograph below you can see two yarn tails at the cast on edge. You can also see that I have two strands of working yarn. Once you have cast on, you join the stitches in one color to the other by knitting a round with Color A. (You have to be careful not to twist the colors like you would with any join in the round except with this technique you have two joins). You work up to the working yarn strand of Color B knit the round up to the working yarn of Color A. That is all you do. For two color stripes you work the complete round. If you are using more colors you work up to the next working yarn (Multiple Color Stripes). The first time I tried this technique it seemed like magic. How does it work? If you've done any color knitting in the round, you know that when you end a round it does not line up with the beginning of the round. You get a jog, Circular knitting is a spiral. There really isn't a beginning and and end and this technique takes advantage of that property. In the photo below, notice how the white yarn cast on spirals over the blue cast on edge. Before you get too excited about this technique, there are pitfalls. Like any colorwork, yarn management is a problem. For each stripe, you must have a ball of yarn. The other problem is when you pick up the new color. When first tried this I had a tendency to pull the new yarn tightly. All this does is make the stitches from the previous round much smaller. It is quite ugly. Be sure to work the first few stitches in the new color with an even tension. There won't be Salon this week as I will be in Las Vegas for the weekend. It is the anniversary of my mother-in-law's death and Las Vegas was her favorite place so we are dedicating our trip to her. If I never make another post, you will know that I won big and have moved to the South of France. I was reminded that we needed a pattern for new TKGA members. I designed this hat years ago and have been meaning to write up the pattern so here is my opportunity. Like last year, I am making hats using the the pattern for the TKGA staff and a few others. I've finished four hats and have three to go. It doesn't take much time even though it uses reversible cables. I used Swans Island Natural Colors for the blue and cream hats. Recognize the gray as George's favorite yarn?